What do you do when your early product is already uber cool...where do you go from uber cool? Felix Baumgartner (not the sky diving dare devil...the watchmaking genius) shows the way. 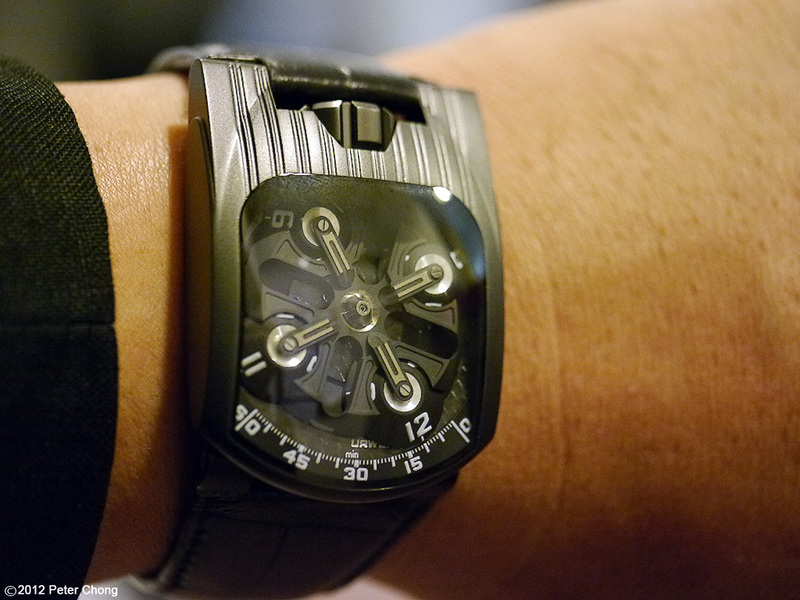 I get to wear the Urwerk watches...all 3 super duper ultra cool watches in one evening...and lived to tell the tale. The year was 2003, and the world was not quite ready for such a radical design...the UR-103 burst into the scene. Truly a ubercool product even on introduction...now made iconic...and still futuristic looking. 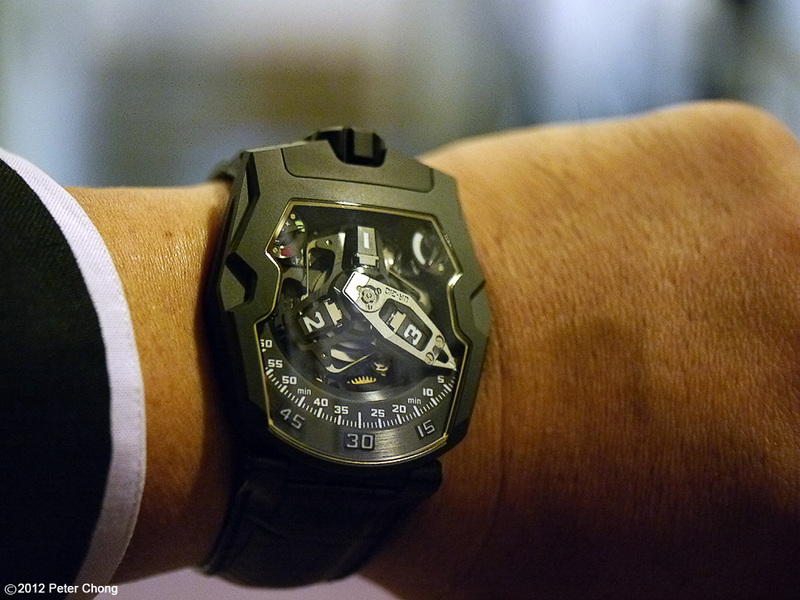 Certainly my favourite Urwerk. White gold case, only 25 made. Redesigned the titanium cross, replaced by an ARCAP one which wraps the hour satelites in sapphire. Even cooler than uber cool! Super ultra uber cool? Is there such a word? 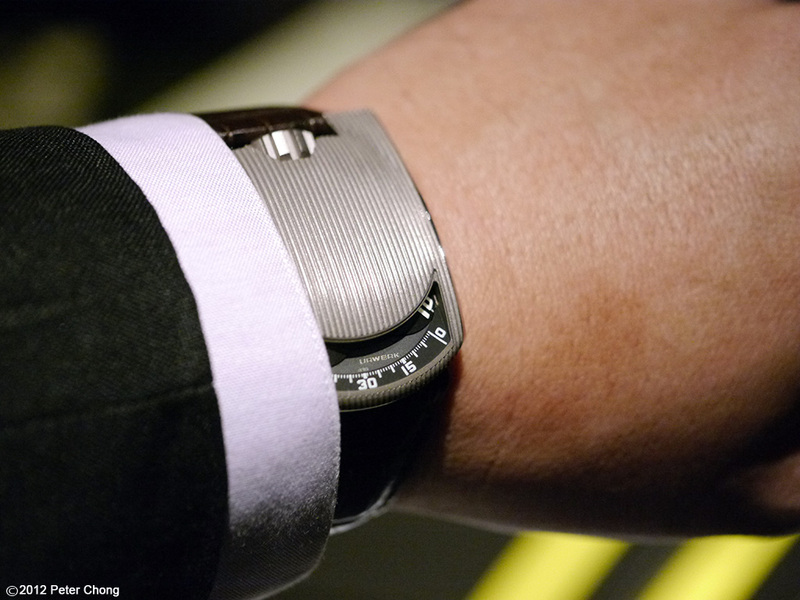 The 210 is the world's first wrist watch which provides feedback to the owner...how active the owner has been in the last 2 hours...perhaps not the most useful information, but seriously cool. I will run out of cool adjectives...but Felix whispered into my ear that come October 2013, another even more super duper ultra uber cool watch will hit the market...I await in anticipation. Photonote: Lighting was extremely difficult in this environment...I was at Jaan restaurant...dim lighting...I went entrance to the kitchen to shoot these...but remnants of the warm restaurant light and the stark florescent lighting made photographs which are less than ideal. Photo links are dead. Looking forward to the shots. Interesting Anthony...they work for me...on IE, Firefox on my PC, and on Safari and Chrome on my Ipad. can I have other feedback please?